Very simple to construct an Automatic Garden light using Solar Panel and LED light. ON in the evening and OFF in the morning. No switching needed and it light the premises of home even if inmates are not there. No circuit complication is here instead only a Relay and few components are used to make this efficient Solar light. It is very well lighting my home. LED Tube lights are costly lights but susceptible to instant damage. Since it uses an LED Driver and very sensitive LED Chips, voltage fluctuations, voltage surge, over heating etc can destroy it easily. But all the parts of the LED Tube light will not fail, so that we can easily repair it. The major problem may be the failure of one or more LED chips or the driver. By doing some repair works, we can use the LED Tube light again. I found one of my 12 Watts LED Tube light is not glowing and decided to repair it. Now it is working well. Its expense was just Rs.50 for the driver only. See the step wise method of LED Tube light repairing. Why going for a complex circuit to make an Emergency Light automatic? Now different types of low cost Portable LED Emergency lights are available but these are not automatic in function. A Mobile charger like adapter is supplied along with these for charging. But we have to turn on / off the light manually using the switch. 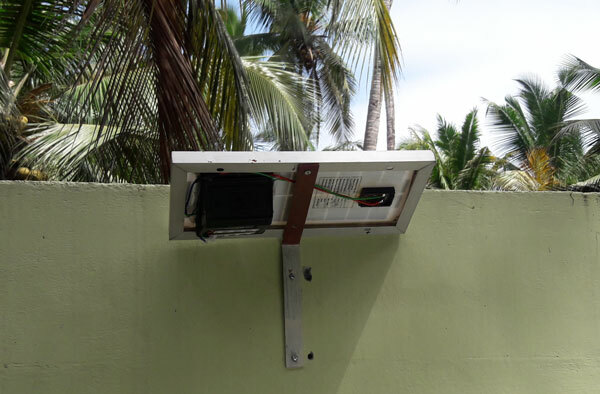 We can easily convert these kinds of Emergency lights into automatic so that when the power fails, the light turns on and when the power resumes, it turns off and enter into charging mode. We need only one relay and a diode for this. The advantage of the relay is that, full current will flow to the LED panel to get maximum brightness. Why wasting energy by continuously switching on the Washbasin light? Just install this Motion sensor based LED light. When you move towards the Washbasin, the light turns on. It stays on for three minutes and turns off. You can also use this as a Cupboard light. Its power is 6 watts. Cool! No switching is needed and saves considerable amount of energy. Its cost is just Rs. 150.Let us see its working. 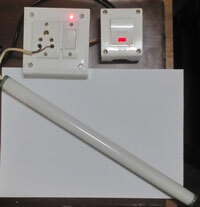 You can make an LED Emergency lamp easily using the LED Panel available now. The lamp turns on when the power fails and turns off when the power resumes. When the mains power is available, the 12 V 7.5 Ah battery charges. Since LED panel is used, the emergency light can have a back up time of many hours. You can make 9 Watt or 18 Watt Emergency lamp using the circuit presented here.Its Backup time will be 10 Hours.Its cost will be around Rs. 950. Of these, the battery alone costs Rs.800. If properly maintained, the battery will last more than 4 years.